Join Kent A. Davis who is an associate director at McREL International. He facilitates workshops and professional learning for K‒12 teachers and administrators on research-based leadership and instructional practices including principal and teacher evaluation. Kent also works with school leadership teams on implementing researched-based practices to improve student learning. Kent has served as a teacher and administrator in public education for 32 years. Prior to joining McREL, he served in various capacities including principal and associate superintendent in the Deer Valley Unified School District in Phoenix, Arizona. As associate superintendent of educational services, Kent was responsible for supervision of principals and several departments including curriculum, instruction and assessment, student support services (special education), information services and technology, and Title I and II. Prior to this, he was the associate superintendent of administrative services where he oversaw transportation, food and nutrition, graphics communication, information services, growth management, construction, maintenance/facilities, and technology. Kent has a doctorate in educational leadership and policy studies from Arizona State University. His Master of Education and Bachelor of Arts degrees are in Elementary Education from the University of Arizona. 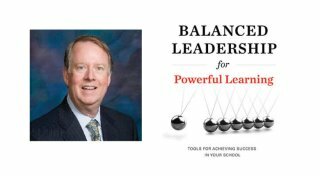 In this three-webinar focused on Balanced Leadership for School Improvement, participants will be introduced to these components and offered ideas for specific leadership actions that can be used to advance school improvement efforts. Register now and mention Smart Education to receive $100 off the full fee.